We all know that human body needs a certain amount of vitamins, minerals and enzymes for proper functioning and to stay healthy. With a well-balanced diet, our body can get all the vitamins, minerals and enzymes it needs. Vitamins and minerals are essential for the proper functioning of all processes in the body and for the preservation of health. well balanced diet provides intake of the all necessary vitamins and minerals for normal growth and development of the body. Our organism can best utilize vitamins and minerals from food, i.e. from natural sources. In the case of improper diet, supplements are very often used to get all the vitamins and minerals we need in order to meet the needs of the body. Since today’s diet is poor in vitamins and minerals and due to fast way of modern life, many people have deficiency in certain vitamin or mineral. The problem with vitamin deficiency is relatively common, especially in early spring. Without certain vitamin or mineral, we may feel weakness, fatigue, lethargy and we are more susceptible to diseases. Surprisingly, there are many signs and symptoms when someone is vitamin deficiency. Take a look at the mirror and evaluate whether you have any of the symptoms and see what your body is trying to tell you. This may be a symptom that indicates a deficiency of B complex vitamins, especially B12. This vitamins enhance beauty by counteracting damage caused by free-radicals. Without this vitamins, we may also feel tired and depressed. Increase the intake of meat and seafood. 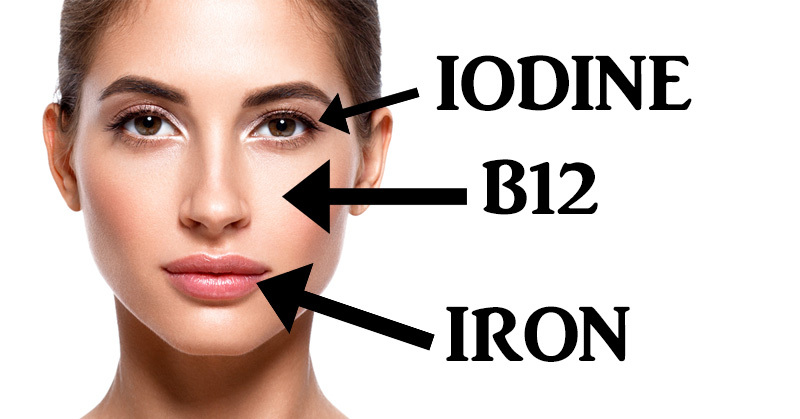 If you notice that your eyes are swollen without any particular reason, your body obviously lack iodine. Consume more fish, red meat, poultry, milk and milk products, cheese and eggs. Dry, brittle hair and dandruff are signal for lack of vitamin B7, commonly known as biotin. This vitamin maintain a healthy nervous system and is essential for the metabolism. To increase its amount in the body, eat more meat, fish, vegetables, fortified cereals, corn, fruits and legumes. Dry, cracked and chapped lips may be a sign of iron deficiency. This may also indicate low blood pressure. Iron deficiency is the most common nutritional deficiency in the United States. Iron rich foods are red meat, pork and poultry, seafood, dark green leafy vegetables especially spinach, beans, dried fruit, pasta, fortified cereals etc. In spite of fact that bleeding gums usually are result of improper dental hygiene, problem with bleeding gums may also be due to lack of Vitamin C in the body. Consume more citrus fruits, red peppers, kale, broccoli, strawberries etc.